Recently, the local paper in my old home town, the “Tri-County News” shutdown.Â Falling victim to the failing economy and changing dynamics of how people get the information they need.Â Newspapers still provide some useful functions, filling in the gaps that electronic media doesn’t seem to do well yet. Here is a good effort toÂ resurrect a resource to fill in some of those gaps. As we begin publishing the new weekly Tri-County Tribune for circulation in the Junction City, Harrisburg and Monroe communities, weâ€™d like to share with you, our readers, our vision for the paper and its role in the community. First, we believe a local newspaper is as an integral part of a community. While more and more Americans, especially in larger urban areas, turn to their computers and other electronic media for their news, we believe many of you, especially in smaller communities, recognize and appreciate the role a local newspaper plays in your community. You like to read â€œhardâ€ news with a genuinely local focus; you like to read and see action photos of your children, your grandchildren and your friendsâ€™ and neighborsâ€™ children as they engage in school activities and sports; you like to read the â€œsoftâ€ side of the newsâ€¦.stories of community members and their special achievements, activities and interests; you like to read short features and announcements of upcoming community events; you like to read opinion pieces by local writers on local issues; you like to see ads promoting local stores and service providers; in sum, you like a paper that is, truly, your â€œhometownâ€ paper. Itâ€™s our mission as the tri-communityâ€™s new paper, to be that â€œhometownâ€ paper. 1) Weâ€™re opening the paper because we truly believe our three local communities need and deserve to have a local, community based, newspaper. We believe a community without its local paper is less of a community. We believe our tri-communities deserve to thrive and succeed and we feel we can play a part in achieving such success. We believe the communities will help us succeed as we help the communities succeed. We see the whole process as a partnership with all of us benefiting from that partnership. 2) Weâ€™re not foolish enough to believe the paper will make our fortune. We donâ€™t have any dreams of being William Randolph Hearst or Rupert Murdoch. If we can publish the paper, distribute it to our readers, pay our staff, pay our venders, pay the rent, and keep the ink in the ledger black, weâ€™ll be happy. 3) We have chosen to provide the paper at no cost to you. It will be mailed free to residents in the tri-community area and it will be available in local business establishments at no cost. We are depending on revenue from advertising to cover the cost of the paper. Our success depends on local businesses advertising in our communityâ€™s paper and you, our readers, patronizing those local businesses. We will strive to produce a paper â€œworthâ€ readingâ€¦.and a paper worth reading is worth advertising in. 4) However, if you find our paper â€œsimply too good to be freeâ€, weâ€™ve got a deal for you. At each location where you can get your free paper, you may place fifty cents in a donation container and EVERY CENT you donate in appreciation of the paper, WILL GO DIRECTLY TO LOCAL CHARITIES. Times are tough and we realize that during such times more folks need help from charities, while, at the same time, those tough times make it more difficult for those charities to get donations. Weâ€™d like to join with you to help support those charities as they help our community members. We have a very experienced, competent staff of journalism professionals. Weâ€™re all very enthused to publish a new paper for our communities. Weâ€™re all excited for this new adventure. Weâ€™re proud to become part of the Junction City, Harrisburg and Monroe communities and hope you will be proud to have us. Please share this email with any of your friends or business associates that you think may be interested. As we move forward in this endeavor, we appreciate your feedback and support. This entry was posted in Social on January 19, 2010 by golinielcomblog. For now the game is only available for purchase through Danish retailers: gamesweb.dk and DACbookshop.dk. 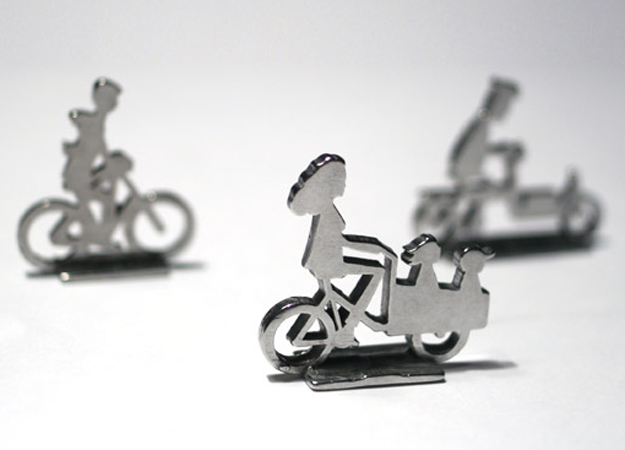 This entry was posted in Bicycling & Fitness on January 15, 2010 by golinielcomblog. 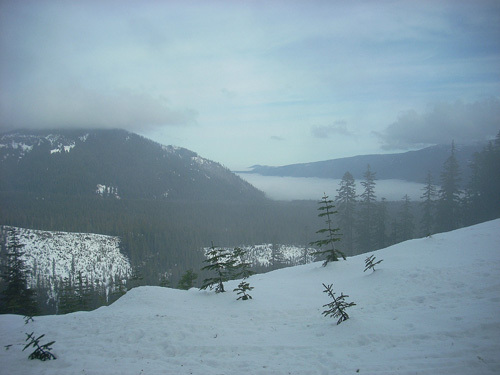 We snowshoed out from Bennett Pass rest area, along the ridge to one of our favorite viewpoints. The rains and warmer weather has turned this weeks now into a crunchy walk, hard enough that our poles rarely penetrated the surface. And no snows on the trees at all. We were walking in the low laying clouds, but the temperatures were quite comfortable. This is an out and back walk, simple to follow, with no significant elevation changes. Here we encountered a downed tree on the trail that was no real obstacle while on foot. It is at this point we like to stop for lunch and enjoy the view of the mountain. Today there was no such mountain view. 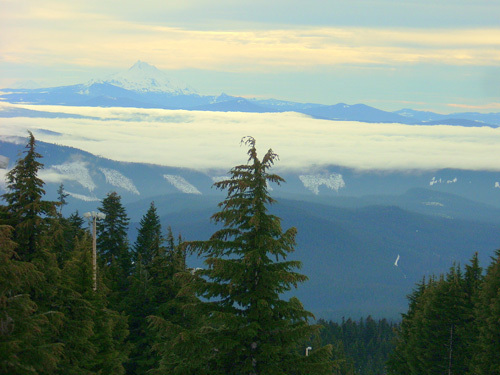 Stopping at Timberline lodge, we were afforded a pretty good view through the clouds, of Mt. Jefferson. 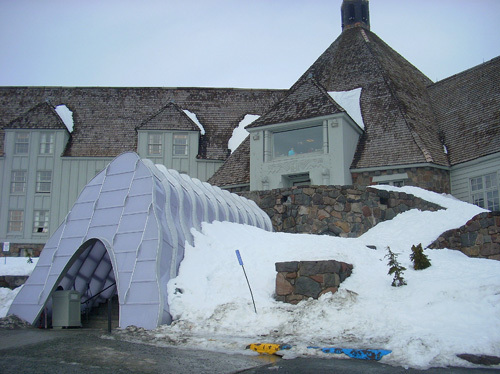 Timberline has installed a new walkway to keep the snow drifts from the entrance. Aesthetically speaking, it isn’t much of an improvement over the old Quonset hut style walkway it has replaced. It really doesn’t seem to fit into the style of the Lodge, but I suppose its more about function than form. This entry was posted in Our Environment on January 13, 2010 by golinielcomblog. We took a little time to ride around Oregon City prior to the new Year. It was really pretty cold, but sunny and clear, and with the right layer of clothing we kept pretty comfortable. The ride took us late into the day and snow began to fall as we made our way home. But, we made it home, and into the hot tub prior to the heavy accumulation began. 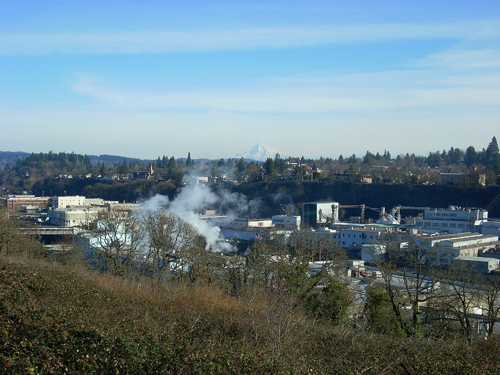 On the west side of the Oregon City bridge, above the locks on the road to Willamette, we had a great view of Mt. Hood. 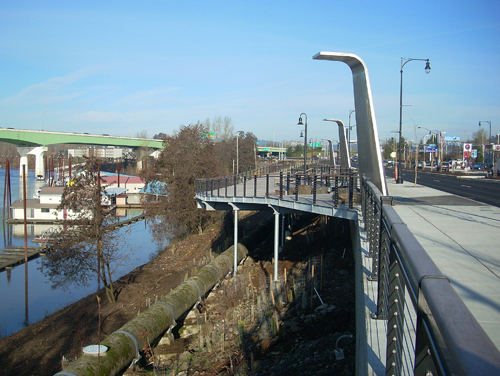 The esplanade between Mcloughlin Blvd and the river is complete, and open. It is a great space, well designed for walking and biking. 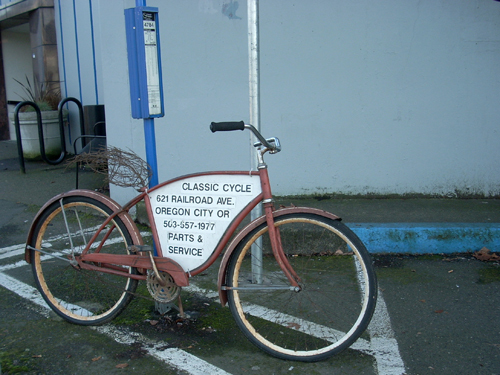 Just opposite the Oregon City elevator, is Classic Cycle. It was closed on the Monday that we rode by. We hope to return on another day. They have several of these bikes in the area. The bike boulevard on Spokane street, off Tacoma at the Sellwood bridge is done. 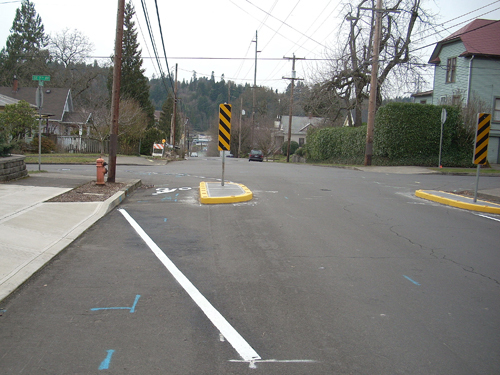 These curbs are intended to slow traffic, constricting it, making it safer in the intersections. This entry was posted in Bicycling & Fitness on January 1, 2010 by golinielcomblog.